Ananda Pagoda Festival is one of the biggest in Bagan. Though held mostly to worship and raise funds for upkeep of the Buddha, commerce flourishes among the tents set up around the Pagoda. Villagers in bullock carts add to the festive atmosphere. The Nhtet Pyit Taung Pagoda Festival is a small festival in Nyaung Oo celebrated by villagers, marked by the setting up of stalls selling local products, and the preparation of HTAMANE, a sticky rice dish prepared with peanuts, ginger and onions to be shared by all. In prosperous years, traditional entertainers are invited to present stage shows including dances, opera and drama. Water Festival is the run-up to Myanmar New Year. People splash water on each other to commemorate the passage of time, washing away past misdeeds, hoping for spiritual renewal and praying that the monsoon will bring bountiful harvests. After the last day of the Water Festival on 16 April, on the following day 17 April Thingyan marks the start of the Myanmar New Year following the lunar calendar. The Full Moon Day of Kason is marked by the water-pouring ceremony at the Maha-Bodhi tree, the holy Bodhi tree (Fiscus Religiosa) at the foot of which Gotama Buddha attained Buddhahood. This pagoda, famous for its original wall paintings still intact after all the years, holds an annual celebration to which villagers flock from far and near. They also take the chance to pay homage to Buddha at the nearby Yoke Sone Kyaung Pagoda, renowned for its antique hand-carved walls. Waso Full Moon Day signals the beginning of Buddhist Lent, and is mostly observed by alms-giving to monks and to the needy. Law Ka Nandar Pagoda is located in New Bagan, about 10 minutes from Thiripyitsaya by car. Mya Zedi Pagoda is located in Myinkapar village, which is about 5 minutes from Thiripyitsaya by car. Manuhar Pagoda is located in Myinkapar Village, about 5 minutes from Thiripyitsaya by car. The Tadingyut Candle Light Festival celebrates the end of Buddhist Lent, during which Pagodas are illuminated by hundreds of candles. 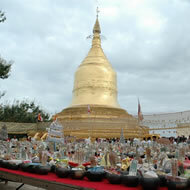 The Shwezigon Pagoda compound becomes a bustling marketplace when pilgrims and villagers from near and far come to pay homage to the Buddha whose relics are enshrined in the Pagoda. Tazaundaing is observed by holding a weaving competition between teams of men and women, where they produce saffron-colored robes for monks. Prizes are given at the end of the competition at dawn, and robes are offered to monks. Alo Taw Pyi Pagoda Festival in Bagan Pagoda is well-known as a wish-fulfilling pagoda and the festival is normally held on the full moon day of Nat-taw. Although srictly speaking the Myanmer people consider Thingyan as their New Year, they also celebrate　January 1st in a more modest way.